Ten Timor-Leste community broadcasters produced strategies for making their stations play a stronger role in their communities at an AusAID-supported program at the APJC in October. The program, Community Radio for Development in Timor-Leste, focused on skills in journalism, radio production and management, with an emphasis on building links with communities. It was officially opened by Timor-Leste’s Ambassador to Australia, Abel Guterres, who spoke of community radio’s importance in national development and its capacity to give a voice to underrepresented groups. Staff of commercial, public and community radio stations in Victoria took part in the program, speaking at workshops and hosting visits to stations by the group. 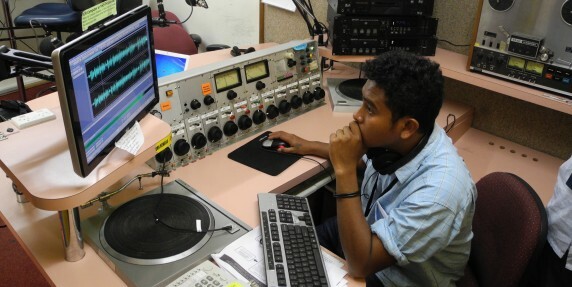 With help from community radio station 3CR, the group produced a program of interviews with Timorese in Australia for broadcast in Timor-Leste. The aim of the interview exercise was to hone the broadcasters’ interview and radio production skills, and to get practise in current affairs programming. The interviews explored the development challenges that Timor-Leste faces in health, gender equality, education and employment. The group travelled to regional Victoria to see how regional community radio stations plan local news coverage and present community information. They also made contact with Timor-Leste friendships groups in Ballarat, Bendigo and Geelong and discussed strategies for using community radio to help local development projects in Timor-Leste.